One of the most popular games ever is The Game of Life board game. For decades, kids from about 8-14yrs have enjoyed finding out what the future holds: education, family, career, retirement. Like most evergreen board game franchises, there are dozens of versions of Game of Life. Family Guy is just one, and I think it’s well-suited to the subject. The graphics have always been a strong point of GOL and Family Guy is no exception. There are lots of in-jokes for fans to spot, both on the board and in the cards you collect. It’s popular with collectors and Amazon customers have given it very high ratings. Recommended. 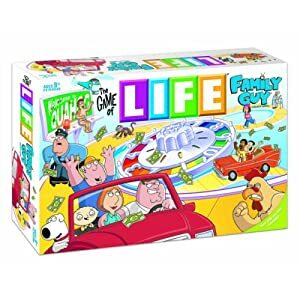 If you’ve played the Family Guy Game of Life board game, please rate it by clicking on the Comments link below the eBay listings.